A little while ago I made a post compiling the posters for the docs short listed by the Academy. 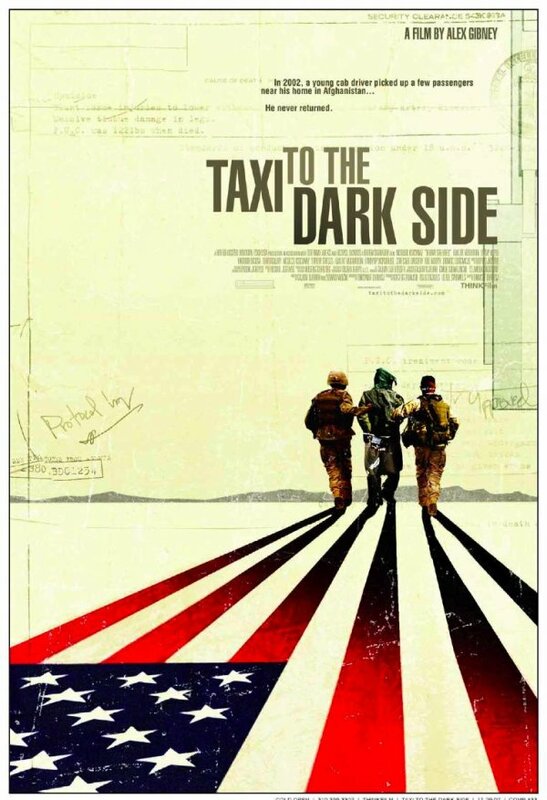 One of the few films for which I couldn’t find a poster was Taxi to the Dark Side, a documentary about the the torture practices of the United States in Afghanistan, Iraq and Guantanamo Bay. Well, that movie now has a poster, which you can see above, but that poster has been rejected by the MPAA. Don’t see nothing wrong here. Oh my God, hide the children. I could go on. The truth is that the image used in the poster is not especially gruesome or horrific. In fact, it’s quite low key considering the subject matter, and the MPAA approves several posters with much stronger images every year. The thing that makes this particular poster shocking is not the image itself, but the facts behind it. And that seems to be what the MPAA is objecting to, for whatever reason: references to the U.S. torture scandal. The MPAA claims that it has objected to the use of the hood in previous posters, even in posters for horror movies, so it’s only being consistent. But that is a transparent dodge. The only reason that the hood is as strongly associated with torture in the first place is the recent torture scandal. Once again, by opposing the depiction of the hood in these films the MPAA is not really going against any depiction of torture, but specifically opposing depictions that are connected to the torture scandal. Adding to the controversy is the fact that the image in the poster was made from an news photo showing an actual prisoner and an U.S. soldier. But that seems neither here nor there. Obviously that are many non staged photographs that would be objectionable if put in a poster. I just don’t see any good reason why this one would be so. The MPAA had already rejected the poster for The Road to Guantanamo last year, for similar reasons. But the image in that poster was much more disturbing by itself. Which is not to say it should have been rejected, but the rejection of the poster for Taxi to the Dark Side looks a lot more ridiculous and unexplainable. But perhaps I’m missing something. Feel free, as always, to disagree with me in comments.